Creatures of exquisite, enchanting beauty, Mermaids radiate an aura of unadulterated grace. Few of the good can bear to look into a Mermaid's eyes and suffer the reflection of their own conscience. Even evil enemies are left confused and disorientated in a mermaid's presence. Magic: Level 3 spellcaster, can be upgraded to Level 4 for +35 pts. Mermaids can only be attacked in hand to hand combat if the attacker passes a leadership test -2. * If the Mermaid is operating independently or has joined a unit and is being selectively targetted by a missile weapon (a hochland long rifle for example) then the ranged missile unit must take a leadership test -2 to fire upon her. If the Mermaid has joined a unit the enemy does not have to take a leadership test to fire upon the unit as a whole (even if, for instance, an area effect template could result in the mermaid being wounded or killed). Mermaids are able to manipulate the waves of magic like no others, their only peers on the surface world are the High Elves and the Slann. While Mermaids possess great strength of mind and will they are naturally reclusive and are reluctant to join units, preferring to rely on their own wits. 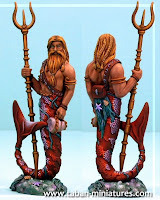 Mermaids can be fielded either alone or in a unit of Trident Guard. Mermaids will never join more "lowly units".